Mocatta & Goldsmid was created more than 400 years ago, in 1684, through an association of the Mocatta and Goldsmid families. Today, the company is owned by Scotia-Mocatta, which is a subsidiary of Scotiabank. Scotiabank is a member of the London Bullion Market Association. 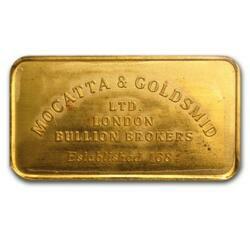 Mocatta & Goldsmid is not a refiner but it distributes bars coming from the Britannia Refined Metal Ltd.
For more information, go to the Britannia Refined Metal Ltd page.